Earlier this week, Mass Oyster visited Wellfleet to drop off a minivan full of recycled oyster shell for use in a zone set aside for oysters to grow and reproduce. When we pulled in at the Shellfish Constable’s office to make the drop off, one of the fellows exclaimed “Holy cow!” when we showed him our load. It was roughly 4 times the 2012 drop off and a fraction of what we will have in 2014. Terry’s program continues to gain strong momentum. A load of recycled shell graciously accepted by Wellfleet Officials. The day was beautiful with sunshine, balmy sea breezes, and blue skies. While waiting for the tour to start, we could see our shell loaded on the spreader ready to head out for disbursal in lines on the harbor floor. Wellfleet uses a sand spreader on a barge. Wellfleet uses home grown device a sandspreader mounted on a barge to drop the shell. We also took a walk around before Curt Felix gave us a tour of the set aside zone. 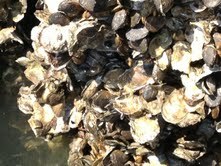 It was interesting to see how abundant the oysters were. Here is a photo of the pilings on the town wharf, which is covered in oysters. 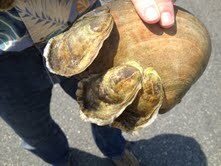 These sizable oysters are easily reached, but not harvested as the site is off limits. Oysters growing on the town pier are off limits to harvest and remain untouched. The tour was well attended with people from as far away as Texas. Curt Felix led the tour. He is on the Wellfleet Comprehensive Waste Water Planning Committee and has been integral to the project. 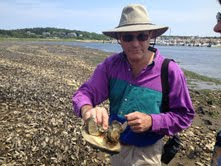 Curt Felix with Sea Clam Shell with oysters growing on them. He explained the rationale for the project in that this area of the Harbor was barren of oysters, so setting it aside did not harm commercial interests. It also was an area with marginal water quality as Duck Creek’s flow has a substantial nitrogen content Then sea clam shell was spread using a commercial road sand spreader mounted on a barge. Wellfleet has a natural oyster set, so young free floating oysters that exist in the harbor began setting on the hard shell. Once set it grew. Oysters growing on sea clam shell. Wellfleet Harbor Lines of shell with oysters growing on them. The exact number of oysters present in the site is not known but it is well into 7 figures, which means that they are filtering over 50 million gallons of water per day. That is making a measurable difference. Measurements taken periodically last year indicate that the area of the zone had a higher average water quality then all the areas around it including those further out in Wellfleet Harbor. The water levels measurements even reached a level of Excellent on the EPA’s nitrogen scale. On the site an attendee holds up a shell with sizable oysters on it. One interesting change in the area was that the amount and depth of mud had dropped significantly. Curt attributed this to three factors. First, the oysters were filtering out the particulates that normally add to the mud. Second, they were pulling out the nitrogen that feeds the organisms that make the mud. And finally they were digesting some of the particles from the mud when it was stirred up with tidal flows. Below is an interesting photo of oysters growing on oysters; forming that reef-like structure that grows up to be able to mitigate wave action. As the site matures, these branching projections should become larger and more common. The oysters growing upward on top of other oysters are in the exact center of this photo. It was a great day from start to finish- seeing this innovative project making a difference and our recycled shell contributing to it.